We are living in a knowledge based economy. Word can spread quickly if you are offering important information for download on your website. One way to increase traffic to your website is to offer your customers the ability to download informative documents from your website. They can then read these documents when they are not online and even print them out to read when they are not on their computer. In this article, we will show you how to create a well organized Download Manager to help you display and track these download files. A download manager is an important part of any interactive business or organizational website. Downloaders are a way to offer virtual products such as PDF slide shows and PDF tutorials to your readers. These downloads can be offered on three kinds of pages – those open to the public, those open only to registered users and those pages only open to registered users who have paid a fee and joined a subscription based club. Even if you are offering document downloads to your customers for free, you will still want to track how many times each document has been downloaded and where these special documents are on your website. If you go to the Joomla Extension Directory, and click on Directories, Downloads, you will see that there are many free Download Managers to choose from. However, most of these do not keep track of the number of times a document has been downloaded and others are quite difficult to install. Some are also complex and can make it difficult for your customers to use. One of the best download managers is Phoca Download. It is a little complex for the average business owner to install. But it is very easy to use once it is installed and it is very easy for customers to use because it has a nice appearance which can be easily customized for your business website. It also has a batch uploader for adding several documents at the same time. As a final bonus, it comes in all kinds of languages making it ideal for an international business website. To get Phoca Download, go to the Joomla Extension Directory and click Directories, Downloads. Then click Phoca Downloads. There is extensive documentation on how to use this extension. But it is a little overwhelming as most businesses will only use 10% of the actual features. So we will provide a simpler set of Instructions here. Click on Download. Then click on the Joomla 3 version Download. Transfer this folder to your website Extensions folder. Then install Phoca Download with your website Extension Manager. This takes you to the Phoca Control Panel where you will see a screen with 12 icons. Then go to your Media Manager and open the Phocadownload folder. Click Browse and find your Home computer icons folders and add these PDF icons one to this special folder. If you have more than a couple of files that you want to allow viewers to download, you should create a category folder structure – similar to how we organized our Joomla articles into an articles category folder structure and how we organized our images into an images folder structure. This is done first by organizing all of your PDFs and other downloads into folders on your Home computer. This will allow us to offer four different downloads to different groups of users. The Public folder will be for free downloads that do not require registration. 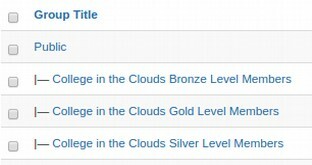 The Bronze Level folder will be for free downloads for registered users. The Silver and Gold folders will be for more detailed downloads which require a payment in addition to registration. It is a good idea to keep file sizes under 3 MB as some Internet providers do not allow users to upload or transfer files larger than 3 MB. Phoca Downloads limits the file size of downloads to 3 MB (it is possible to reset this to a larger file size). If you PDF files exceed 3 MB, you should either split them into more files with smaller sizes or use a software program to reduce the file size of your PDFs. First, go to Users, Groups and create three new user groups, Bronze, Silver and Gold Members. (we already have a public members access level). The parent group for each new group is Public. Then go to Users, Access Levels to create three new access levels. and assign each of them to their user groups and to the super user group to give super users access to these special pages. These files are available for public download. 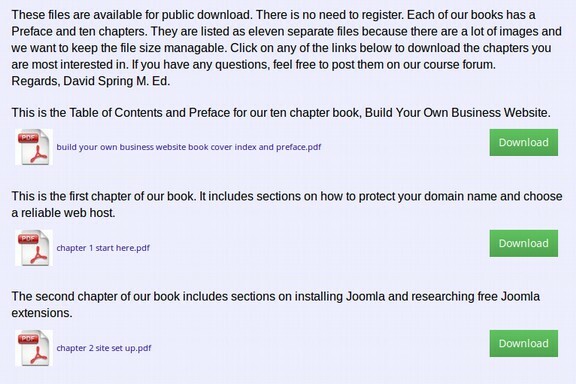 There is no need to register to download the Preface and Chapters 1 and 2 of Create Your Own Interactive Website. Chapters 3 and 4 are also available for free simply by registering at our main course website, CollegeInTheClouds.org. The remaining chapters 5 through 10 are available for $10 for a PDF or Kindle or $20 for our Print Book. If you have any questions, feel free to post them on our forum. You can add an image below the Description if you wish. Then click on the Meta Data Options tab and fill it in. Then click Save and Close. Repeat to create the other three categories. Once we have our four categories, we are ready to add our files. To add PDF’s, go to Components, Phocadownload, Files. Then click New. First, click Select Category and choose the category you want to put the PDF in. Then to the right of the Filename box, click on Select Filename. If you have a lot of files, before you upload any files, it is important to create a folder structure here which matches the folder structure on your home computer. Alternately, you can have different folders of files for different groups. We will create a folder called public_downloads. To do this, click the Create Folder tab. Then enter a folder name in the box. Use lower case text with no spaces for your folder names. Then click CREATE FOLDER. To open a folder, just click on it. Repeat to create four folders. Select the public_downloads folder. To enter files into this folder one at a time, click Choose File. Then browse to the PDF file you want to upload on your computer. Then click on Start Upload. Repeat this upload process for all of the PDFs you want to display. If you have a lot of files to load and/or you have files larger than 3 MB that you want to load, then go to the Phoca Download Control Panel and click Options in the upper right corner. Then click the Uploads tab. By default, Maximum Upload Size (Administrator) is set for 3.14 MB. Add a 0 after the 3 to raise this to 30.14 MB. Also set Enable Multiple Uploads (Administrator) to Yes. Then click Save and Close. You may also need to change the upload settings on your web host server account. Now go back to the File Upload screen and you will see the limit raised and a Multiple Uploads tab. Click on the Multiple Upload tab. You can now add files up to ten at a time by clicking on Add Files. You will need a high speed connection to load large files. Your customers will need a high speed Internet connection to download them! After loading the first three PDFs into the Public Folder, click on the blue up arrow in the upper left corner of this screen to go back to the folders screen. Pick the Bronze folder and load 2 more PDFs to it. Then load the remaining Chapter PDFs in the Silver folder. It is a good idea to include a PDF icon to let viewers know that they are downloading a PDF. We can insert a PDF icon to display to the left of this file by clicking on Icon, Select Icon. This takes us to the phocadownloads folder in our Media Manager. Click on the pdf50 icon to insert it. Then give the file a Title. For Direct Link, click Yes. This will give them a direct link to the PDF file in case they want to copy the link to the PDF or preview it in a browser window. This is the Preface for our book, Create Your Own Interactive Website. The complete book is available for $10 for a PDF or Kindle or $20 for our Print Book at Amazon.com. If you have any questions, feel free to post them on our forum. You can also enter an image here if you want. Then Click SAVE and CLOSE. Repeat this process for your remaining files. Things will go much quicker as the folders have already been created and the files have already been uploaded. Each file can be added in under one minute. We now have a long list of PDFs. Note that there is a column to keep track of the number of times each document is downloaded. 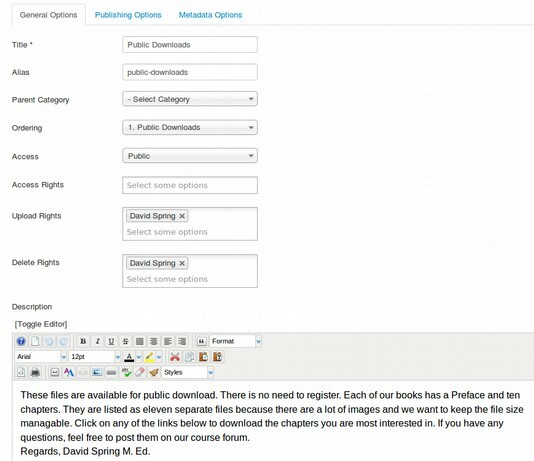 In the next article, we will create a page to display all of our PDF downloads. Website visitors are more likely to download PDF files if they are displayed in an organized manner. 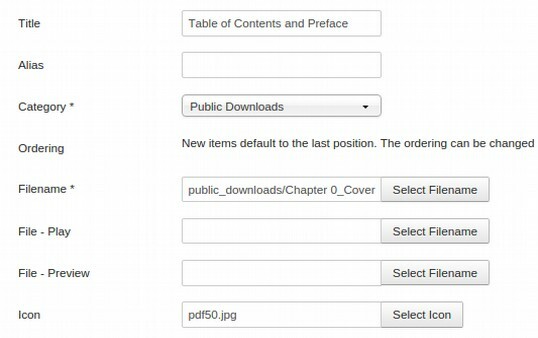 In this article, we will show you one of the best ways to display your PDF downloads. There are two completely different ways to display downloads with Phoca Download. 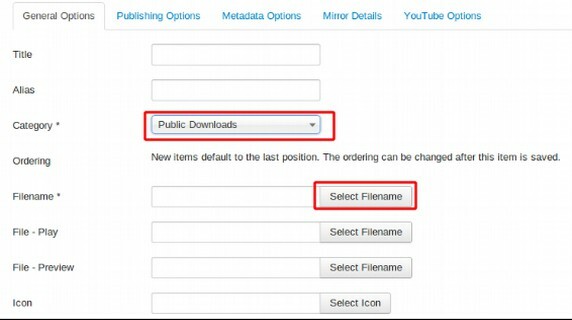 The first is to use a Phoca Downloads special plugin to insert the download(s) in an article. This only allows a very simple display. It also does not allow you to display the description of the PDF or its file size or any special images or features about the PDF. Because of these problems, we will nearly always display our downloads by creating a menu item for them. This allows a much more detailed appearance of downloads. We will therefore cover this second method which is much better for displaying an entire page of Downloads. 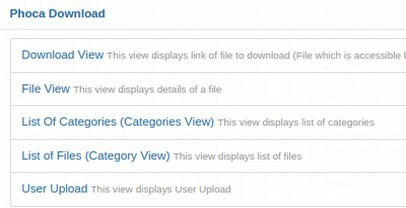 There are three different ways to display downloads with the Phoca Download component. Because our access levels are defined by categories, we want to use the List of Files, Category View. For category, select the Public Downloads. 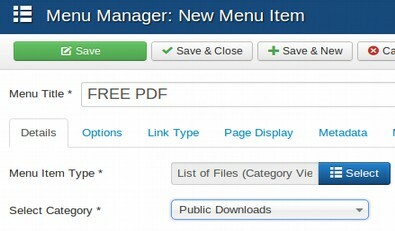 Give the Menu Item a title such as FREE PDFS. Then click save and close. Then click on the menu item in the front end of your website to view the file table. The PDFs download okay. But the PDF icons are messed up. Let's fix this. All of the important settings are in the Display Tab. When you scroll down the page, it appears that there are a lot of settings. But in fact, there are only a few we need to deal with. First, let's hide the Detail button and instead place the File Description with each file. Change the Display Description from Overlib to TOP. Then change Display Detail Button from Yes Overlib to No. Next, scroll down to the Theme Settings. Increase the File Icon Size to 48. We can next add Download menu items accessible for the Bronze level and Silver level members. Now that we have a Free PDFS download page, we are ready to work on improving our Search Engine rankings. That is the subject of the next article.